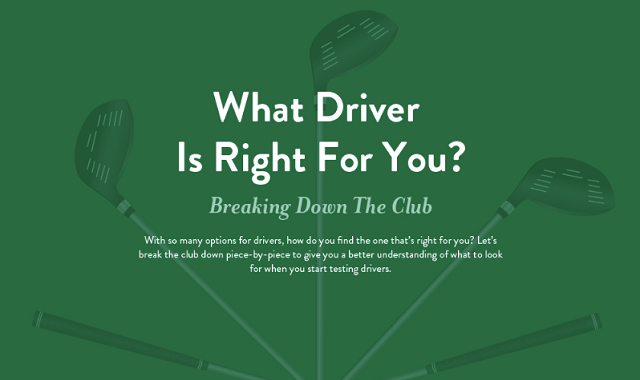 How to determine what Golf Driver is right for you #infographic ~ Visualistan '+g+"
There are a lot of different options out there when it comes to drivers. How important is it to choose the right club? Seemingly minor details, such as the size of the grip and the flex of the shaft will affect your accuracy, the speed of the ball, and the power of your swing. Of course, the right club can affect how well you play at each hole. For example, you won’t get the same results using your wedge as you do your putter, so you’ll choose one over the other at each hole. You’ll probably use your driver heavily during any game. The quality and fit of this club can mean the difference between a great game of a golf and a terrible day on the green. Take a look at the following infographic for more information on choosing the right driver, and you’ll be ready to shop for one that is best suited to you.